Learn all the best ab exercises for men and women on this site. Below are 2 bosu ball ab exercise variations to strengthen your core muscles. 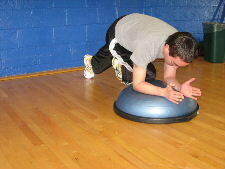 The Bosu Ball is one of my favorite tools for core exercises and ab exercises. Because it's unstable your core and stabilizer muscles must work harder to keep your body in good alignment. The plank is a great core exercise and when you do the plank on an unstable surface, you enhance the core work. 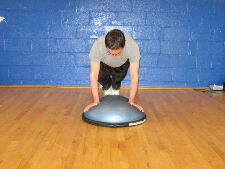 If your gym has a bosu ball, try the exercise below. You can do this exercise from your elbows or your hands. 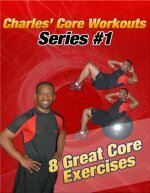 Each one offers slightly different core muscle work, balance challenge, and range of motion. Try them both and use the one you like better. 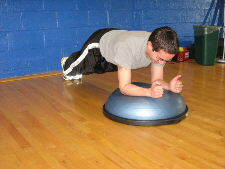 Starting Position: Begin in a plank position with your hands in a comfortable position on the Bosu Ball. Engage your abs, so that your back is in good alignment. Form: While keeping your abs and core tight, bring one knee in towards your opposite elbow, and try to touch your elbow with your knee. Hold for a brief second and then slowly lower to the starting position. Personal Trainer Tips: You can do this ab exercise in alternating fashion or you can focus on one leg at a time. It is very important to be mindful of the position of your lower back during this exercise. If you feel your lower back arching excessively, think about engaging your abs or take a break and rest for a moment. If you have trouble with your wrists on the Bosu Ball, try the variation below. When the elbows are on the Bosu Ball, you will have a little more tension on the abs because you will be more horizontal to gravity. You will also likely feel less range of motion in the hip when the elbows are on the Bosu Ball, but still attempt to touch your opposite knee to your elbow. 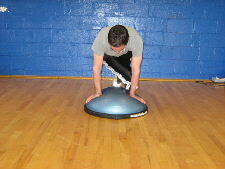 If you find this exercise a little too challenging, try regular straight knee ins on the Bosu Ball. Often times men and women choose different exercises, but the best ab exercises for men are also the best ab exercises for women. The plank is a very popular core exercise and it can help both men and women, but if you don't have access to a Bosu Ball, there are still many variations of the plank exercise that you can do. You can even do these 2 exercises on the floor or a stability ball. If you are just beginning your core workout routine, try mastering the basic plank exercise variations first and then progress from there. Also, visit the Picture Directory of Abdominal Exercises to learn more of the best ab exercises for men and women or try one of the free ab workouts.